BirthdayReminder is a free Windows 8 Birthday Reminder app that reminds you of important birthdays of friends and family, while you work on your Windows 8 PC. The app syncs with your Facebook account to access the Birthday information of all your contacts and displays timely notifications for the same. This free Windows 8 Birthday Reminder app also comes with live tile support and displays “Today’s Birthdays” on the Start Screen. 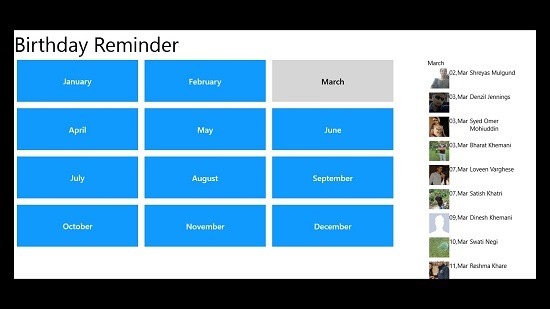 Apart from that, it shows a month-wise list of all the Birthdays falling within an year on your Windows 8 Screen. BirthdayReminder can be downloaded from the Entertainment category in Windows Store, or using the link given at the end of this article. Let’s get you a better idea of the app. BirthdayReminder is a simple and easy to use app. After installing when you first launch the app, it will ask you to login using your Facebook credentials. Once you are logged in, it will ask for your permission to sync all the friends and their birth dates. Once the birth dates are synched with the app, it will show a month-wise listing of all the Birthdays, as shown in the screenshot below. Here in this screenshot you can see the app’s screen is divided into two sections. The left section contains a list of all the months. Clicking on any of them displays the Birthdays falling within that month on the right side, along with photos. Once everything is synced, you will get the updates via message notification and even live tiles. There are dynamic tiles which keep on changing, displaying birthdays of all your friends on the current date. Free Windows 8 Birthday Reminder app. Also checkout some other free Windows 8 Birthday Reminder apps and Windows 8 Birthday Frames app. In today’s busy life, we most of the time forget the birthdays of our very dear ones and regret later for not wishing and planning a great birthday party. BirthdayReminder is great app that help us in reminding important Birthdays. The only part where it lags is its interface, which is not that attractive to pull the crowd to use this app. But otherwise, it is good. Click the link below to get the app from Windows Store. Don’t forget to share your thoughts and suggetions via comments.